Nike will not only be bringing back the LeBron Soldier 1 as part of their Think 16 Collection, but they’ll also be releasing an inspired LeBron Soldier 12. Dressed in its OG colorway. 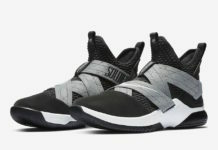 This Nike LeBron Soldier 12 is a nod to when LeBron James torched the Detroit Pistons for 48 points in Game 5 of the 2007 Eastern Conference Finals, which included King James scoring the Cavs’ final 25 points in a 109-107 victory. With the win, James’ would go on to win the series and advance for his first NBA Finals appearance. It features a White upper with Navy detailing and luxurious hits of Gold on the “LJ23” logo, outlining the Nike Swoosh and speckling on the sole. Look for this LeBron Soldier 12 to release alongside the “25 Straight” LeBron Soldier 1 on May 31st. The retail price tag is set at $140 USD.